The real Twin Peaks: Visiting these locations is like stepping into the series' wonderful, strange world. Part of the appeal of Twin Peaks — and much of its enduring mystique — comes from its colorful, distinctive Pacific Northwest settings. 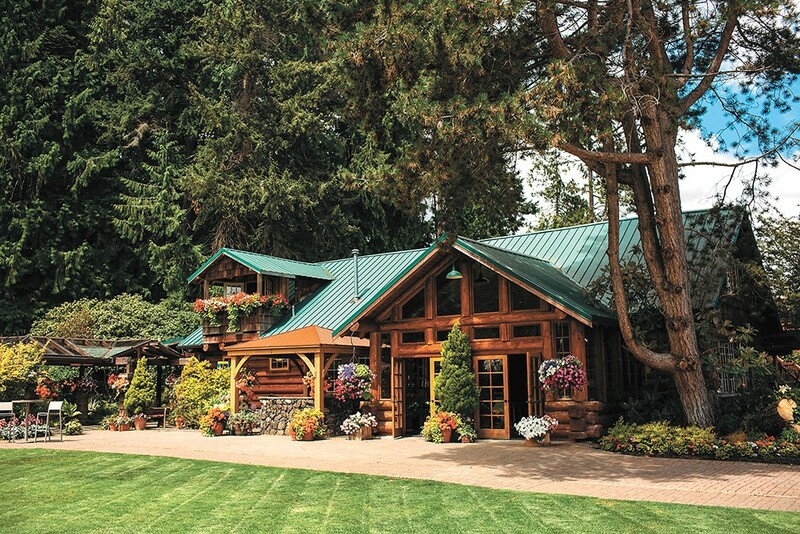 A lot of the series' interiors were shot on Hollywood soundstages, but exteriors, especially in the early episodes, were filmed in such quaint, picturesque Washington towns as North Bend, Snoqualmie and Fall City. The enduring popularity of Twin Peaks means those towns are still visited by series enthusiasts — I stopped at a few last February during a road trip to the Oregon coast — and it's somewhat surreal to inhabit locations that seem so otherworldly on TV. Here are five you should check out if you find yourself on the other side of the state. Situated on an otherwise nondescript corner, this greasy spoon, known as the Double R Diner on the show, serves as a meeting place for many Twin Peaks residents. A fire ravaged the building in 2000, but you would never know that now: It still looks like it did back in 1990, wood paneling and all. The hallway leading to the bathrooms is covered in Twin Peaks memorabilia, including framed photos of series co-creator David Lynch and the actors filming there. Order one of nearly 40 different burger varieties, knock back a damn fine cup of coffee and have some "Twin Peaks Cherry Pie," which is $4.99 a slice. Snoqualmie is just three miles away from North Bend, and there's a lot to see there. Once used to transport lumber, this bridge is seen in the pilot episode as Laura's friend Ronette, who escaped from the killer's clutches, stumbles down the nearby railroad tracks. It's now a pedestrian bridge crossing over the Snoqualmie River, and visitors have scrawled the distinctive Twin Peaks symbol on many of the steel girders. The site of the Twin Peaks sign, seen on the show's title card, is also nearby, though the sign itself has long since been removed. 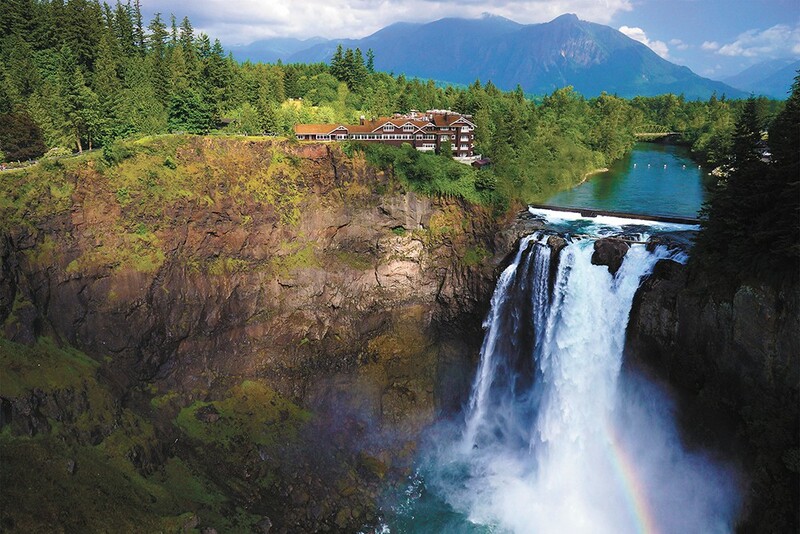 If you'd never seen Snoqualmie Falls in person, you might think that its appearance on Twin Peaks was some kind of special effect. The stand-in for the exterior of the Great Northern Hotel, seen in just about every episode, the lodge offers an amazing view both inside and out. Its interiors, however, were not used for the show. The belching smokestacks of the Packard Sawmill appear in the show's opening credits sequence, but most of the Snoqualmie Falls Lumber Company has since been torn down (one of those stacks is still standing and is visible from the road). The building that doubled as the sheriff's department, one of the most prominent locations in Twin Peaks, is right across the street; it's now a school where you can learn to drive race cars. 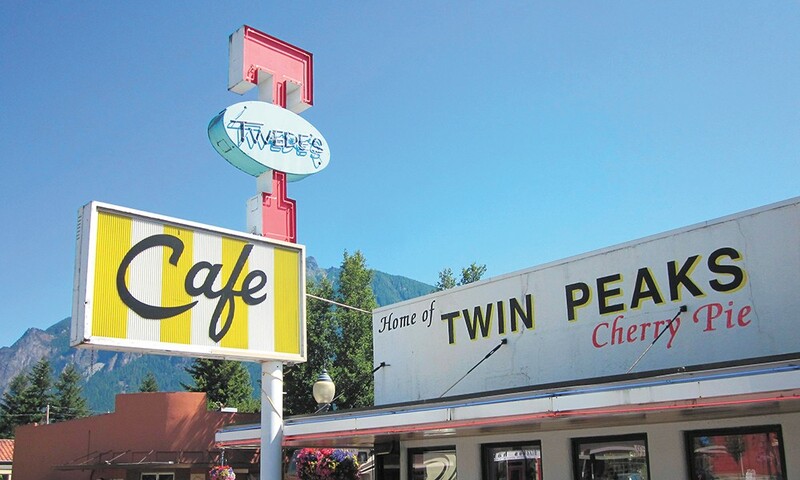 This stop's a bit out of the way — it's on the Kitsap Peninsula, a two-hour drive from Snoqualmie and North Bend — but a number of pivotal Twin Peaks places are here. The Kiana Lodge was actually used for two different locations: as the lobby of the Great Northern Hotel (with its distinctive Native American wall decorations) and the exterior of the Blue Pine Lodge, where the Martell family resides. And just a few feet away is the place where Laura Palmer's body was first discovered on the beach.